Nature is flush with remedies to spring clean your body and mind. 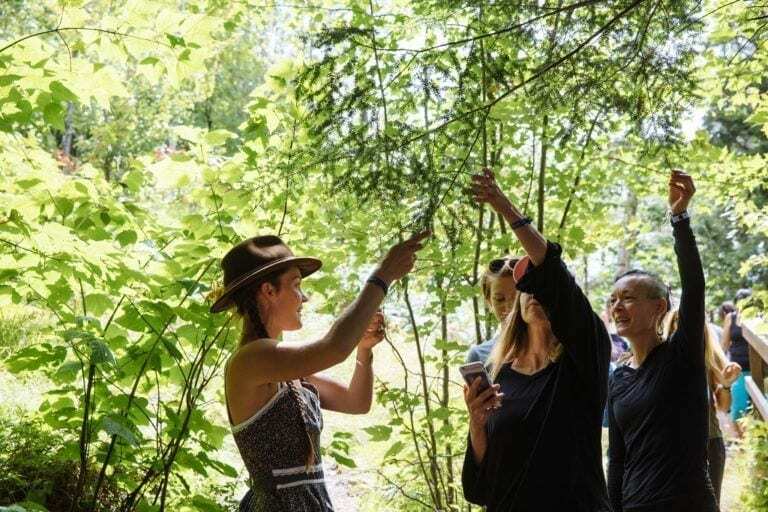 Discover the bounty of the Earth provides on a nature hike at Wanderlust. When bird songs begin to cascade from high branches of the trees, and the frozen ground thaws, releasing the smell of moist earth, we know Kapha season is underway. In your practice, you may feel compelled toward grounding poses, that root you down into your root chakra. As more light fills the day, you may feel the pull out of the wintery hibernation of Vata season to be outside and explore the bounty of the Earth. As the temperature begins to rise and the energy of the earth moves into germination of seeds and buds, the natural world is swept with a sense of rebirth, renewal and the potential for new beginnings. The sap ascends from the ground into trunks and branches of the trees and our bodies too, mirror this process—we are a reflection of the microcosm of nature. Connecting with the natural world by spending time outside is an excellent way to reconnect with Gaia—whether this be a hike in the mountains, a quiet seat in the woods, or participating in one of the many Wanderlust festivals across the country. Integrating mountains, mindfulness and music at a Wanderlust Festival is an exciting way to sync the body and psyche with the natural rhythms of the Earth. Let go of your to-do list (except for making plans to join us at an event this summer) and allow the shifts brought on by a new season to wash over you. Spring is the perfect time to focus on new growth and meet some amazing herbs that can become your allies during this transition. During Kapha season it can be beneficial to focus on skin, lymph, kidney and liver health. It is a fantastic time to begin a new regimen and incorporate herbal medicine into your daily routine. If herbs are new to you, please take note: herbs are powerful in their subtleties. Herbs work with our bodies natural healing system. Unlike over-the-counter drugs, they don’t suppress symptoms instantly. This is not about instantaneous results. Herbs, instead, work deeply and often, over a longer period of time. It can take a few weeks to notice a subtle yet powerful shift in our bodies. According to Chinese medicine, each season is associated with different major organ systems. Spring is associated with the gallbladder and liver. This season brings an abundance of my personal favorites—Nettles, Chickweed, Dandelion and Violet. These herbs are dense with minerals and nutrients and are powerful detoxifiers. Let’s break down each. Be sure to look for them—or ask your nature guide—as you explore the power of nature at a Wanderlust Festival this season. Those who know me are well aware of my healthy obsession with this herb. This efficacious herb pops up from the ground in early spring, dense with energetic potential and nutrients yet also sharp and stinging—possibly reflecting our own energetic state during this seasonal shift. Nettles are rich in minerals and vitamins we may not be exposed to in our daily food intake. Nettles nourish the adrenals, liver and kidneys. This herb helps regulate blood sugar and reduces inflammatory response. Nettles prevent sickness by slowly strengthening the immune system. I credit this herb for my long hair and strong nails, but mostly I find nettles to ground my mind, body and spirit. To invite nettles into your spring process, make an overnight cold infusion of the herb by placing a fistful of dried herb into a gallon sized glass jar and fill with room temperature water. Leave overnight and strain, squeezing the herbs in a cheesecloth and refrigerate for up to a week. Drink a cup or two daily and welcome the shift. Popping out of the earth with energetic vigor at first signs of spring, chickweed (like many early season herbs) are packed with nutrients. Incorporate chickweed into your salads in place of spinach, or mix with other hearty spring greens. They have a gentle and pleasant flavor. A mild diuretic, they support and flush the kidneys, readying these major organs for activity. Chickweed is also great for digestion, increasing the bodies’ ability to absorb nutrients— this is great if we are eating seasonally and beginning to incorporate new foods into our diet. You can also boil the 3 heaping tablespoons of the fresh herb in a quart of water to help relieve constipation, or for a little winter clearing out so to speak. Keep your eyes peeled for chickweed at the farmer’s market, or ask your favorite farmer if you can take some of these “weeds” off of their hands. These little cuties hail the arrival of spring. Dandelions have such a bad reputation! Though they have been labelled an obtrusive weed, Dandelions are actually anything but! Dandelions often grow in polluted soil, that’s why we often see them on the side of highways and construction sites. Their long tap root grows deep to aerate the soil, as well as draw up materials from greater depths to reestablish mineral content of the topsoil. They literally detoxify the earth and they do the same things in our bodies! According to David Hoffman, “[Dandelion] root is one of our most widely applicable, gentle tonics for liver function.” Dandelions’ sunny disposition can actually lift our energetic spirits as well, a tea from the flowers is thought to encourage the release anger and illuminate us from the inside out. The leaves of dandelion are considered a diuretic, which help flush the kidneys and the body from toxins. Dandelion root contains inulin, a prebiotic (a type of soluble fiber found in plants). Prebiotics are converted into short-chain fatty acids by gut bacteria, which nourish colon cells and provide other benefits to the body. Dandelion root clears obstruction from the liver (known as “sludge” which is mostly made of fats) and stimulates the liver to detox! To invite the power of dandelion into your life, pick a few fresh flower tops and leaves to add to your salad or make/purchase a tincture made with the flowers, roots and leaves. Take this once or twice daily to fortify the body and spirit during this season of regeneration. The Greek considered violets to be the symbol for fertility and love. Violets are rumored to have made their debut in love potions. Violet is another nutrient dense herb (shocker! ), and is also a moistening lymphatic. This means it encourages lymphatic flow through the body while hydrating sensitive tissue. Lymphatic fluid contains toxins and much of the body’s waste products so a jump start to the lymphatic system after a lethargic winter is just the ticket for welcoming growth and movement in Kapha season. Many herbs can be drying, you may notice this effect with nettles. Incorporating violet leaves into your nettle infusion can also help balance and hydrate the body while offering valuable minerals and vitamins to support overall efficacy of your bodily systems. Violet flowers are not only elegant, they also carry a delicious, lightly sweet flavor. Incorporate leaves and flowers into a fresh salad for a kidney and liver loving meal! Throw some dried leaves in a jar with your nettles and leave for an overnight cold infusion (see instructions above). With so much life emerging from the earth, take the opportunity to notice the energetic stirring within you and align yourself with the natural world. Drinking infusions and eating herbs can create an alliance with you and nature. During this Kapha rich time, as the earth wakes up, we are offered the potential to take our connection a step further. Take a walk—notice the buds open from the tips of branches, bring consciousness to the green stems popping up in the ground, materializing from the birth of a germinated seed. Soak up the life around you and celebrate your own great potential. 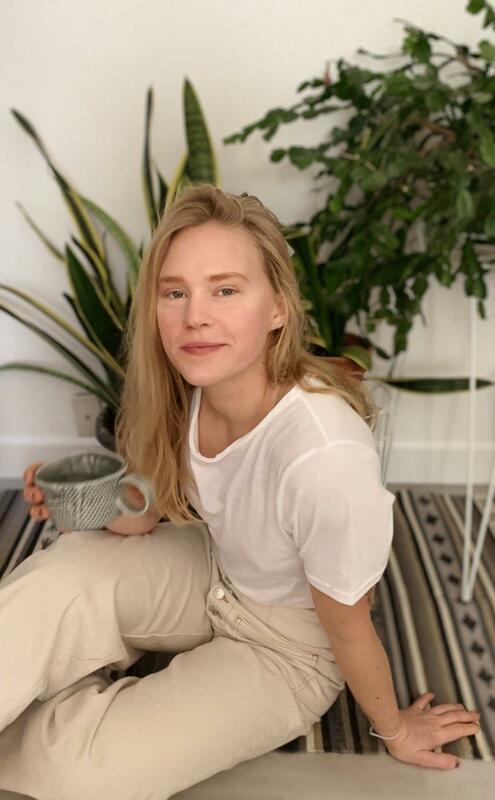 Leslie Bish is currently working as a Medicinal Gardener Apprentice at a biodynamic farm and has spent the past 5 years leading fitness and movement classes in Brooklyn. She is an herbal enthusiast calling on herbs, movement and nutrition to realign human connection to the natural world. Leslie recently completed the Herbaculture Internship Program at Herb Pharm in Williams, Oregon—a rigorous, hands-on immersion program focused herbalism and cultivation of herbs. Her mission is to share plant medicine and bridge the relationship we innately have with nature as our own personal ally.